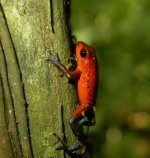 This is the homepage of the Darwin Initiative project 'Building Nicaraguan and Costa Rican capacity in biodiversity conservation'. These pages will be updated regularly throughout the project, which will run from April 2003 - March 2006. Click on the headings above to find out more about the project or on the links below to find out about the collaborators in the project. The Darwin Initiative is a UK Government programme which was announced at the Rio Earth Summit in 1992. The aim of the Initiative is to promote and enhance biodiversity conservation and to implement the Convention on Biological Diversity (CBD) through the funding of collaborative projects. The Initiative is funded and administered by Defra, the UK's Department for Environment, Food and Rural Affairs (www.defra.gov.uk).